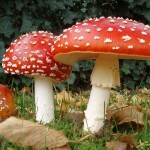 In this episode we talk about the spectrum of mushroom poisoning from Amanita to magic mushrooms. Contributors include Matthew Zuckerman and the UMass Toxicology team Kavita Babu, Katie Boyle, Lynn Farrugia, Stephanie Carreiro, Peter Chai, and Viral Patel along with Mark Neavyn. Mushroom pictures are available here.